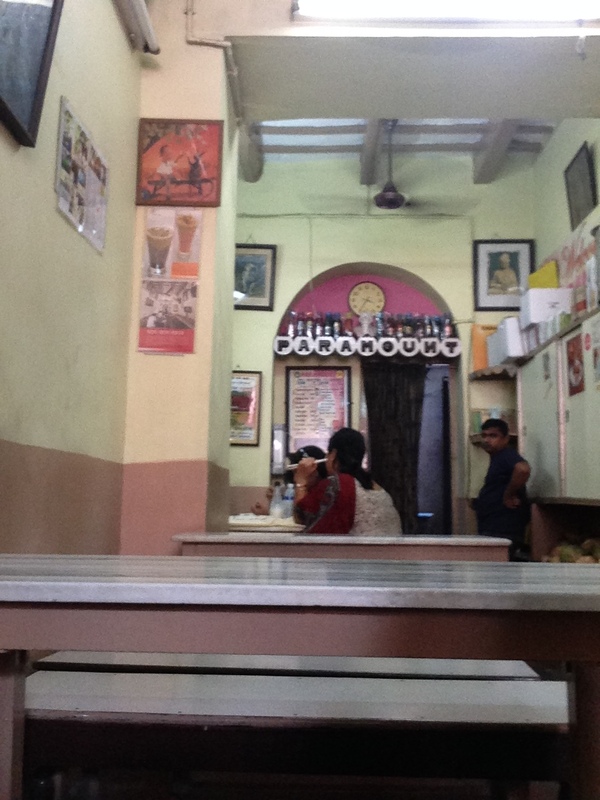 This is a part of YUMMRAJ’s series called TIMELESS KOLKATA EATOUTS – reviews of Heritage Kolkata restaurants. 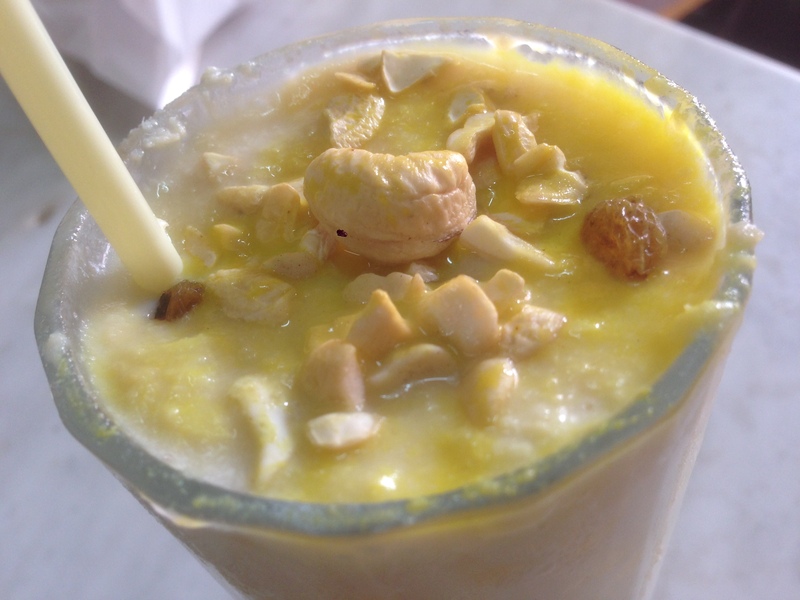 Each restaurant has been rated as ‘Old is Gold’ or ‘Old is no more Gold’ based on the experience. 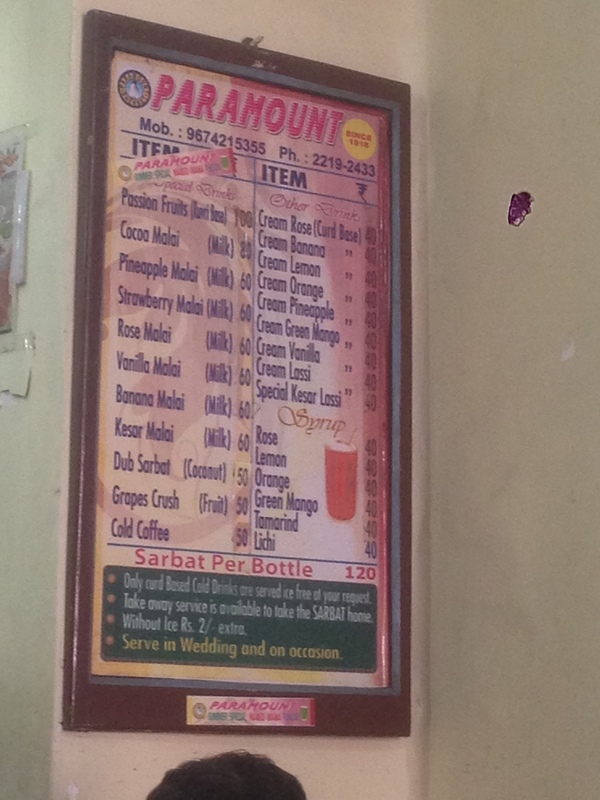 Legendary 96 year old Kolkata restaurant that serves sherbets in a full service set up. 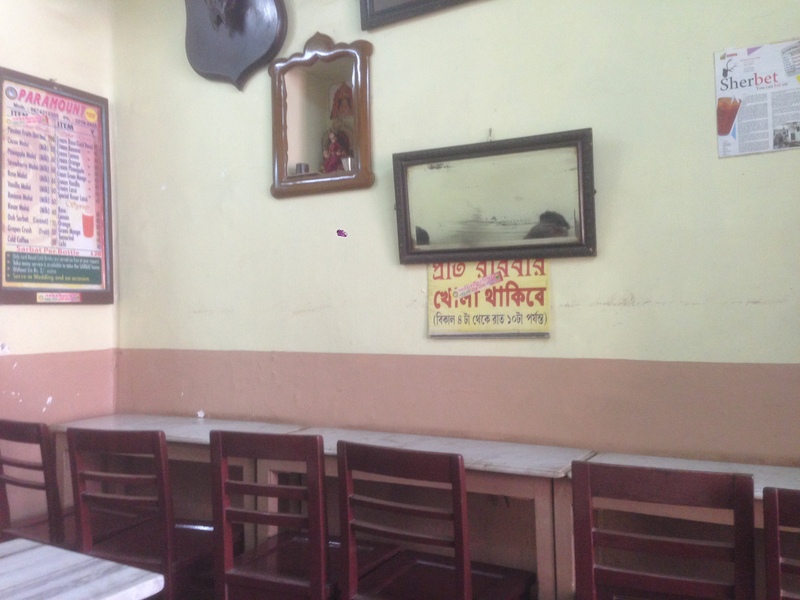 A list on the wall mentions the Legends of Bengal who have been here. 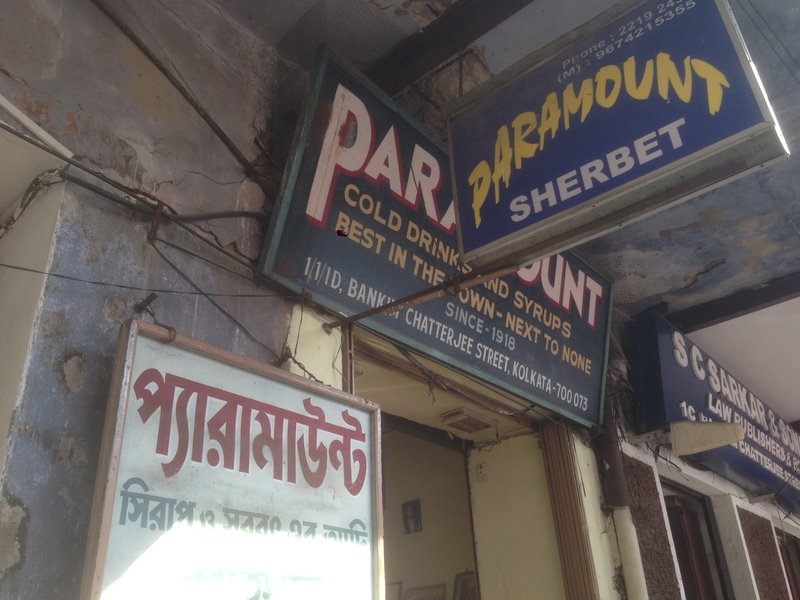 YUMMRAJ says for Paramount – ‘OLD IS GOLD’. Apologize for losing the bill for this restaurant. 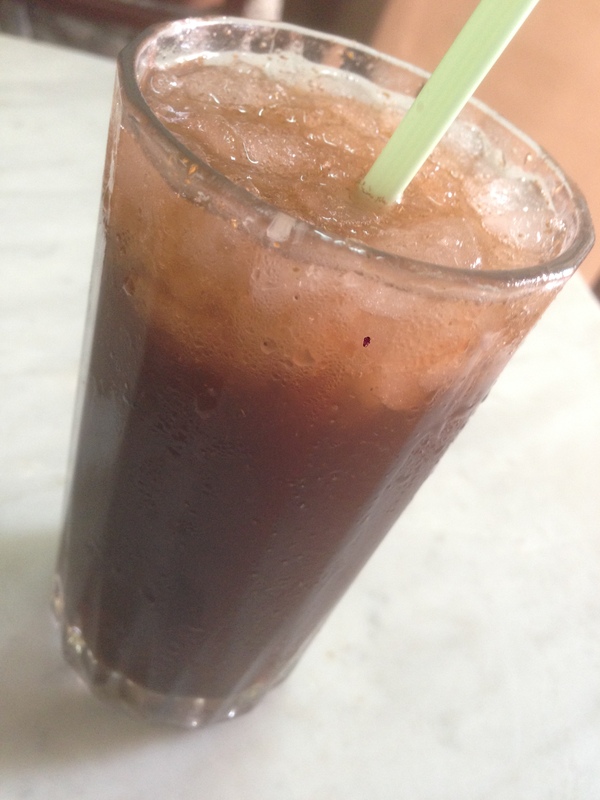 Hence am unable to upload picture of it. 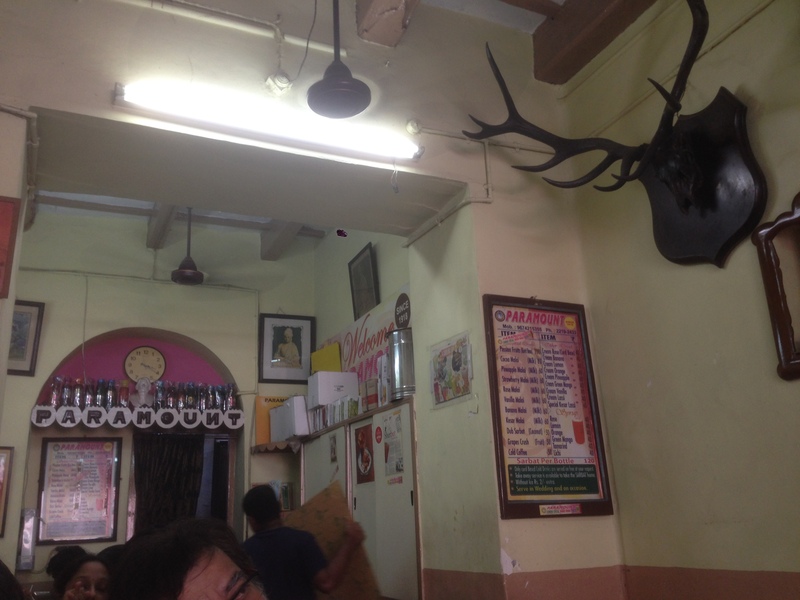 This restaurant has been around since Since 1918.Till today it is run by the same family who started it. The third generation is running it now. The brothers and sister running the shop were themselves present at the shop, managing the place and taking care of accounts. Incredible – that’s what keeps it going. 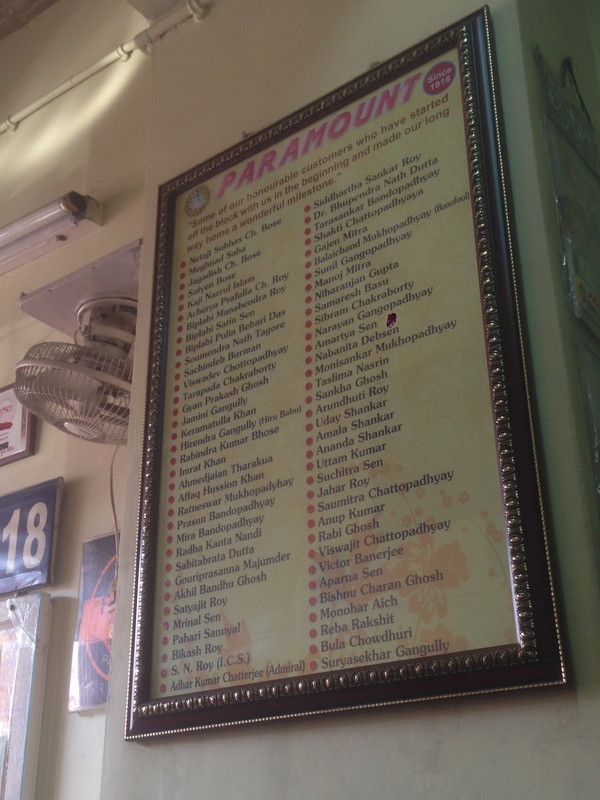 The shop has a list of famous people of Bengal who have visited this shop. Some of the names include netaji subhash Chandra Bose, Satyajit ray, Meghnad Saha, Jagadish Chandra Bose, Uttam Kumar, Suchitra Sen etc. 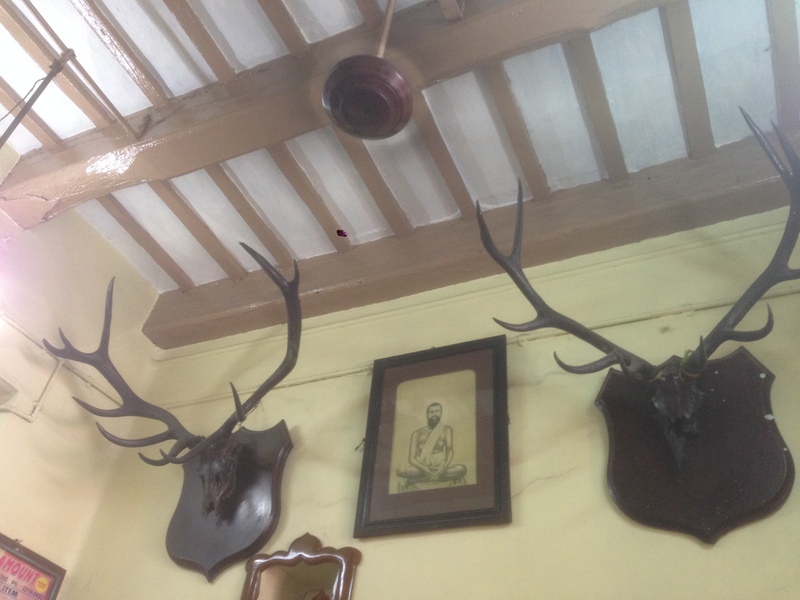 The ceiling of this old building is obviously ‘kori kaath’ – metal & wood beams that was characteristic of buildings of that time. Like most buildings of that time, the Dining Hall has a high ceiling. The concept of this restaurant is interesting. A sharbat store with proper seating arrangement like a restaurant, servers coming & taking order, serving the sharbat & collecting the money. The seats have marble tops. Two stag skulls with branched horns adorn the wall – reminiscent of pre PETA world. 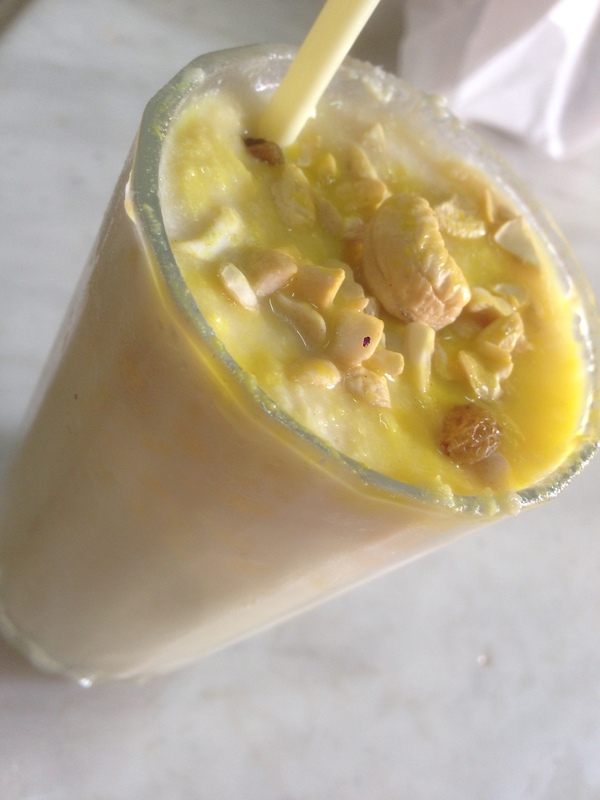 We interacted a lot with the co owner lady & she suggested some good sherbets. The waiting staff were less enthusiastic & were kind of doing a routine boring job. Sherbets were really nice. Look forward to revisiting. 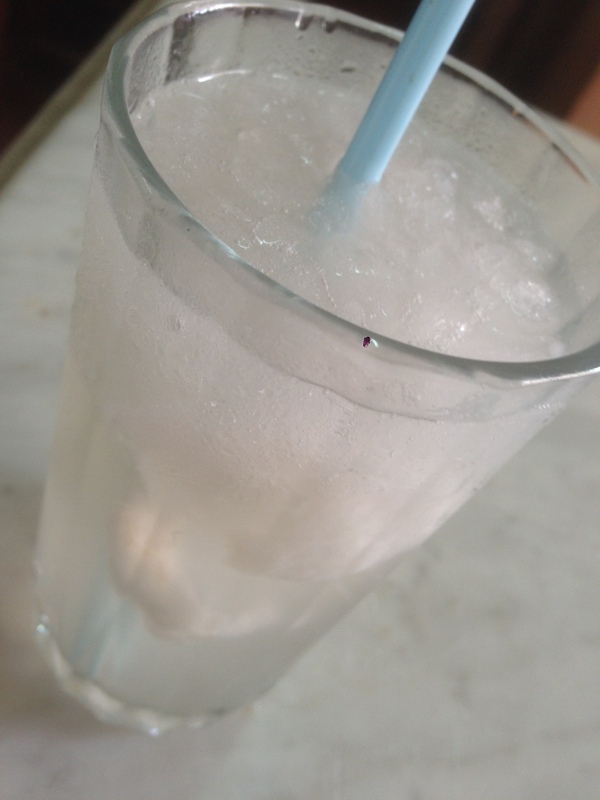 We moved on to Green mango shorbot. The concentrate of this had been made by them inhouse. 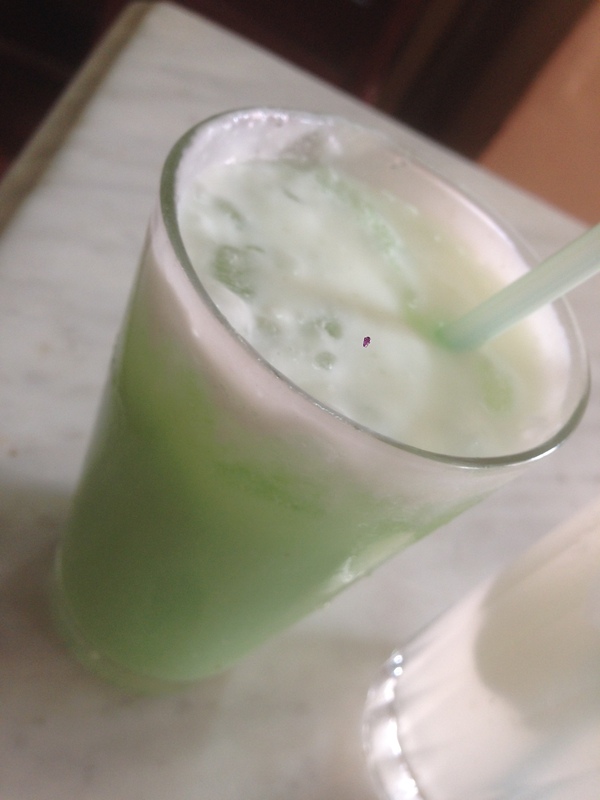 The Green mango sharbat tasted a bit like the synthetic green mango jelly that is available in the market. 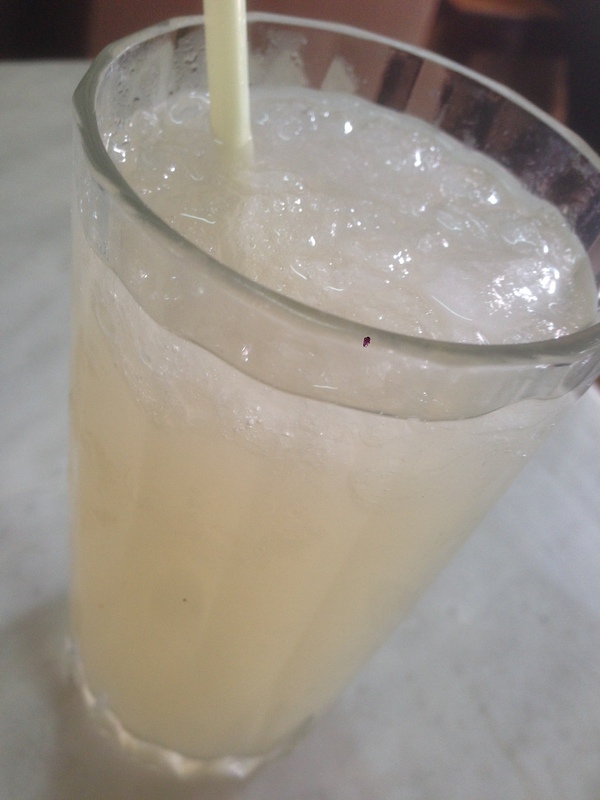 This sharbat was in a dahi base. Tasted very good on its own but very different from what I thought it wud b. rate it 4/5. Overall rating of sherbets at Paramount averages out to 4.15/5. Wud surely revisit.